Modernism, the unalloyed Bauhaus version, has held sway as the go-to design paradigm for American architects since the 1950's. There was a parallel design movement, started by Frank Lloyd Wright and others in the early Twentieth Century, which was indigenous and regional. Wright called it "Organic Architecture," a style of design that was rooted in the land on which a building sat. It developed in design centers around the United States and often drew on vernacular design themes and local materials. It was an adaptation of Modernist principles with indigenous themes. The architects who worked in these styles were regionally diverse. In the San Francisco Bay Area, architects such as Joseph Esherick, William Turnbull and Roger Lee created striking houses using locally available redwood and glass. They borrowed the cedar shingle look from Maybeck and Morgan and gave it a Modern remake. In the American South, Fay Jones and Samuel Mockbee did the same using pine and cypress in their remake of southern farmhouse tropes. The end product was both Modern, regional, and more often than not, compellingly beautiful. About two years ago, I was having lunch with noted regionalist architect David C. Wilson. We tried to develop a brand identity for this style of design that lives just under the radar. Wilson coined the term "Rural Modern." It was perfect. A dozen other titles filtered through the conversation, but Rural Modern stuck. It was accessible, descriptive and complete. Rural Modern is not a replication of the past. It is a variation of Modernism that uses the wisdom and intrinsic beauty of the past to create the future. It is an integration of vernacular design, sustainability, and modernist concepts of openness and livability. I live and work in Northern California, which has a significant design community. I also spend a fair amount of time in Southern California, working for some very creative architects and designers. 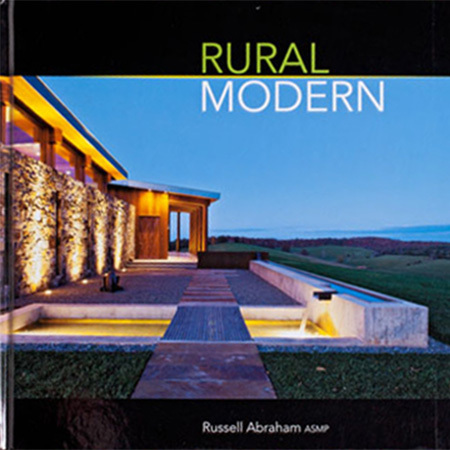 My publisher pressed me to expand the geographic scope of Rural Modern to include a broad brush of noteworthy regional American architects. I was fortunate to find some wonderful architects scattered from the deep South to the shores of Puget Sound. It was a great, if not challenging experience. RAP Hero Final from Eric Sahlin on Vimeo.